152 in stock Need More ? 22 cm  p. : chiefly col. ill.
PRESS HERE, MIX IT UP!, LET'S PLAY! and now SAY ZOOP! Collect all four interactive books from Herve Tullet! 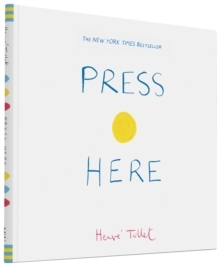 Press Here is the irresistible invitation offered to readers to push the yellow button on the cover of this title--and triggers a magical journey of colour, imagination, and virtual interactivity--all the more remarkable that this adventure has all occured on the flat surface of the simple, printed page.